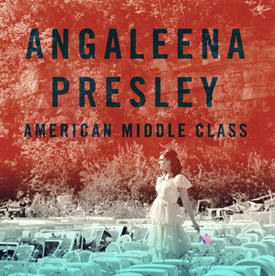 Even if you didn’t know that AMERICAN MIDDLE CLASS was something of a concept album based around the singer’s life; there would be a presumption that Angaleena has lived this type of life by the passion she instills in the lyrics and her delivery on every single song. In the opening track Ain’t No Man I presume she’s singing about her mother who is “as hot as the fire on the end of a cigarette” and a line like that is always going to win my heart and it did. The detail Presley uses in her songs is exceptional; I defy you to listen to Grocery Store and not get angry and tearful at the heartbreaking scenario she describes. Dry County Blues and Pain Pills are absolute peaches of Blue Collar Country songs; detailing the hypocrisies that inhabit small towns like this one; and I can’t not mention Keith Gattis’ dirty guitar solos and the incredible steel playing of Josh Grange who take two great songs onto a whole different level. The title track American Middle Class is another ‘instant’ song – hitting you square on the jaw from the opening when Angaleena’s Daddy talks about his life then the band kick up a storm on the angriest song here; but with the catchiest tune; making it perfect for radio and hearing live. There’s no surprise to find staple Country titles like Knocked Up, Life of the Party and Drunk here, but these are from the singers own life and delivered with only a hint of bitterness and regret; because as everyone knows a good songwriter uses all of life’s experiences to write great songs; and that’s what Presley has done with bells on. As I sit here now listening to this album for the umpteenth time I’m getting angry; only because when the Awards season comes upon us this offering won’t be anywhere near the winners table; possibly because it is ‘too Country for the AMA and too Americana for the CMA’ which is pure hooey! This album is a keeper in every sense and will still be listened to when the latest glamour boy in a Stetson is back packing bags in a supermarket.